Read “Fowl Consequences,” Laurel Anne Hill’s new fantasy/horror short story in Fault Zone: Diverge (Sand Hill Review Press, 2014), an anthology of stories (fiction and nonfiction) and poems. Don’t miss Volume Five of Fault Zone! The edgy San Francisco/Peninsula Writers chose the equally edgy Thomas Ekkens’s cover to wrap up their superb collection of short stories and poems. Kudos to editors Audrey Kalman and Linda Okerland. Stories by Kevin Arnold, Sue Barizon, Jo Carpignano, Dorcas Cheng-Tozun, Emily Eddins, Ann Foster, Darlene Frank, James Hanna, Karen Hartley, Laurel Anne Hill, Diane Jacobson, Amy Kelm, Maurine Killough, Bardi Rosman Koodrin, Elise Frances Miller, Diane Lee Moomey, Lucy Ann Murray, Linda Okerlund, Lisa Meltzer Penn, Frank A. Saunders, Martha Clark Scala, Ellen Six, Eve Visconti, Wendy Walter, and Ollie Mae Trost Welch. Purchase Fault Zone: Diverge on Amazon . 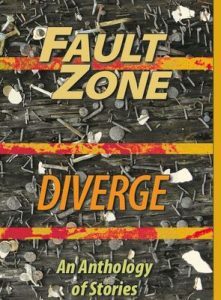 Fault Zone: Diverge is available in both trade paper and electronic versions.